Know More about Islamic Ins. 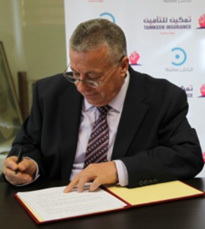 We, the family of Tamkeen Insurance Company, are pleased to welcome the public interested in following with the company’s course since its birth, hoping that our services live up to the aspirations and ambitions of the Palestinian public. Tamkeen strives to provide an umbrella of insurance service for the preservation of national wealth or net worth and achievements as well as the protection of private and public property.